Butterflies add interest in a garden. Colorful butterflies can add beauty, color, life, and interest to your backyard. Besides the well-known monarch, there are over 150 different butterfly species that may be seen in the Midwestern United States. With a little extra planning and proper plant selection you can increase the number and variety of butterflies that visit your yard this summer! Providing plants that supply plenty of nectar will encourage these fragile creatures to visit your garden. A swallowtail feeds on flower nectar. Butterfly gardens can be any size – a few containers in a sunny spot, small beds, or large open fields. A butterfly garden does not have to be big. In fact, it has been found that butterflies prefer scattered groupings of “butterfly plants” rather than one large butterfly garden. You can just incorporate more nectar-producing flowers in an existing garden to lure in additional adult butterflies, or you can create a specific garden that utilizes plants chosen for their value to both adults and caterpillars of selected species. Site butterfly gardens in sunny, protected spots. Sunny area. 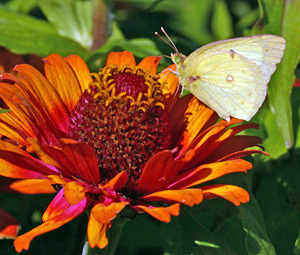 Most plants that are attractive to butterflies need full sun, and butterflies also need sun to warm their bodies for flight, so site your butterfly garden accordingly. Make sure it is also sheltered from harsh winds and is in a place where you will be able to easily watch the butterflies. 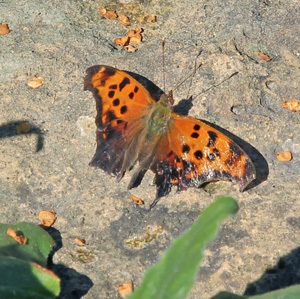 An eastern comma butterfly basks on a warm rock. Warming surfaces. Butterflies rest on rocks, exposed soil, or grasses to capture the sun’s rays to warm their bodies. Provide flat rocks or surfaces for sunning. Butterflies need flowers with a place to land. Water. Natural or man-made shallow puddles or damp areas may help attract groups of certain butterflies. Water is not needed for each grouping of “butterfly plants”, but should in the immediate area of all groupings. Butterflies like pink, purple, orange, yellow, or red flowers. Flower type. Butterflies must land in order to feed, so they prefer plants with either clusters of short tubular flowers or flowers with large, flat petals. Flower color. 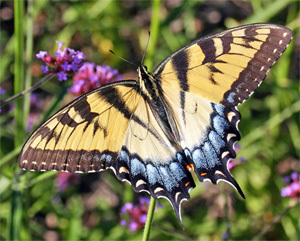 Most butterflies prefer pink, purple, orange, yellow, or red flowers. Some cultivars of the same plant may be more attractive to butterflies than others because of their color. Also, butterflies can see ultraviolet light (which we can’t) so the color we perceive may be different than what they’re seeing. Large masses of a single color are more attractive than plantings with many colors mixed together. Every species needs it own type of food, such as milkweeds for this monarch caterpillar. he plants you select need to provide plant tissue (food) for when they are caterpillars and/or nectar sources for when they are butterflies. Each species of butterfly needs a specific type of food plant for its caterpillars to eat; many of our native trees, shrubs and other plants are important host plants for certain species of caterpillars. 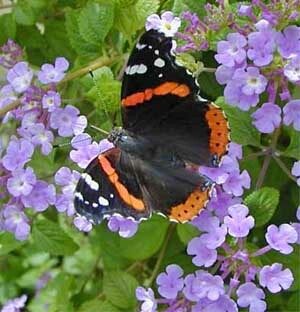 Lantana is an annual plant that is very attractive to butterflies. Plant several different plants with different flowering times to make nectar available throughout spring, summer, and fall. Verbena bonariensis is attractive to many butterflies. Some annual plants for butterflies include alyssum, ageratum, gomphrena, heliotrope, lantana, pentas, salvia, Verbena bonariensis and zinnia. Some good perennials that will serve as nectar sources include black-eyed Susan, blazing star (Liatris), butterfly bush, coneflower, New England aster, and phlox. When searching for nectar, butterflies do not always seek out those flowers that smell good to humans. One example is the milkweed plant. This nectar-rich plant is unappealing to many people, but the butterflies love it. Some weeds, such as dame’s rocket, dandelion, Queen Anne’s lace and thistles, are also good butterfly plants, as are some herbs, such as anise hyssop, catnip, dill, and lavender when in bloom. Avoid using pesticides – including BT – in the butterfly garden as they can kill butterflies and their caterpillars. 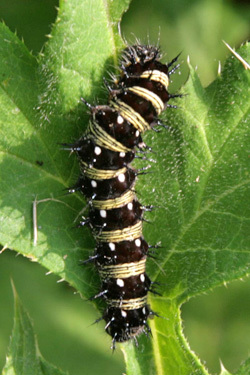 Recommended plants to provide food for caterpillars include birch, cherry, dill, hollyhock, hackberry, plum, sweet mockorange, viburnum, and willow. 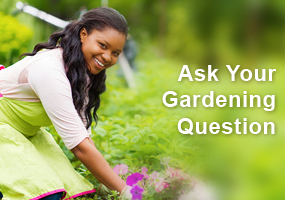 Remember to select plants that are suited to the growing conditions of your yard: soil, moisture, and light. 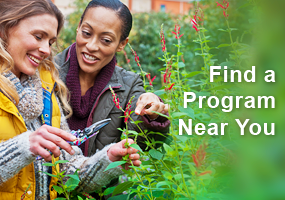 You may also need to change some of your pest-control methods if you want a butterfly garden. Remember, the products that kill undesirable insects will also kill butterflies. If you must use pesticides to protect your butterfly garden, try to choose less toxic or very specific materials. Remember that “natural” does NOT mean “non-toxic.” Make spot treatments on affected plants rather than applications to the entire planting. Do NOT use Bt (Bacillus thuringiensis) in a butterfly garden where you wish to have caterpillars because Bt kills caterpillars. 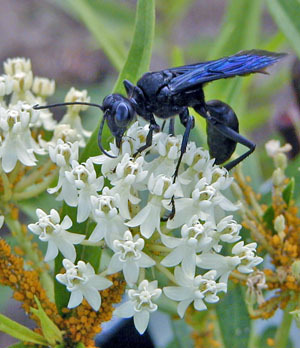 You may attract other nectar-feeding insects to your butterfly garden. 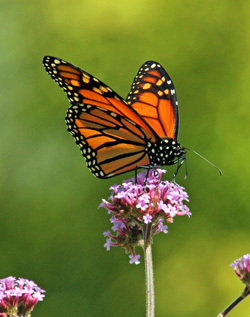 Once established, your butterfly garden may attract many different kinds of butterflies. Butterfly gardens will also attract other nectar-feeding animals. These include hummingbirds, honeybees, bumblebees, and moths. Remember to take some time to enjoy the benefits of your gardening efforts and be patient. 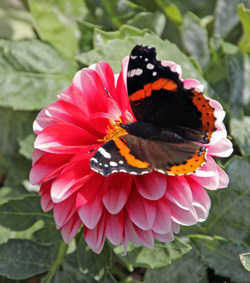 Over time you may find that your butterfly garden is the main attraction of your landscape! 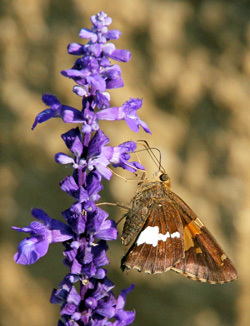 A silver-spotted skipper feeds on mealy cup sage flowers. I am hoping to expand my prairie area with more plants attractive to butterflies. Having specific species mentioned was very helpful as well as tips to include such things as warming surfaces and water sources. I like butterflies. 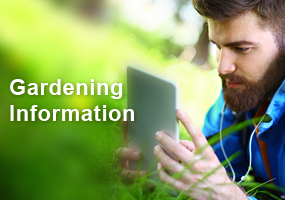 Thanks for sharing tips on how to put create my own butterfly garden. I hope I can do it. Excellent piece. Well written, organized and efficient. 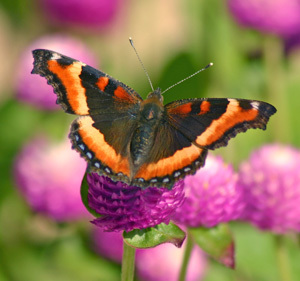 Most butterflies prefer pink, purple, orange, yellow or pink flowers. 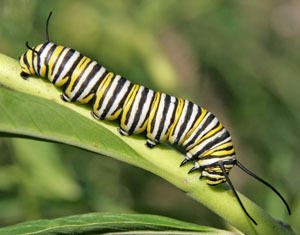 Every species needs its own type of food such as milkweed for the monarch caterpillar. Some annuals for butterflies include alyssum, ageratum, gomphrena, heliotrope, lantana, pentas, salvia, verbena and zinnia. 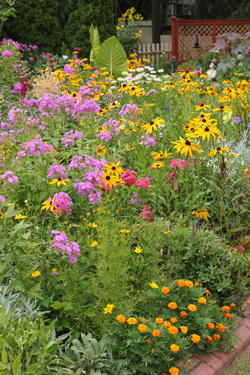 Some good perennials that will serve as nectar sources include black-eyed susans, liatris, butterfly bush, coneflower, New England aster and phlox.